This architecture does not utilize an all-in-one controller at all, but rather utilizes the following major components: PLC, switchgear HMI touchscreen, Ethernet-enabled protective relay, high accuracy power transducer. This architecture is by far the most powerful because it is totally customizable. 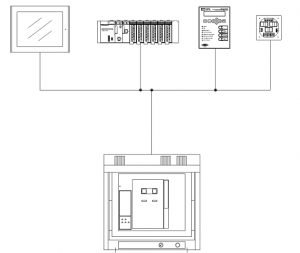 From the I/O to the layout of the switchgear HMI, nothing is “predefined.” By making a secure, broadband connection to the switchgear, complete remote control and monitoring is possible, as well as extracting historical data from the protective relay, making remote program changes, etc. Advantages: Easy, intuitive operation. Complete connectivity over the web. All aspects of power system can be aggregated into a single, common platform. Disadvantages: This is the most expensive design architecture – the cost of the PLC, switchgear HMI, protective relay and power transducer exceed the cost of the all-in-one controller. However, it is incrementally more expensive and not monumentally more expensive!